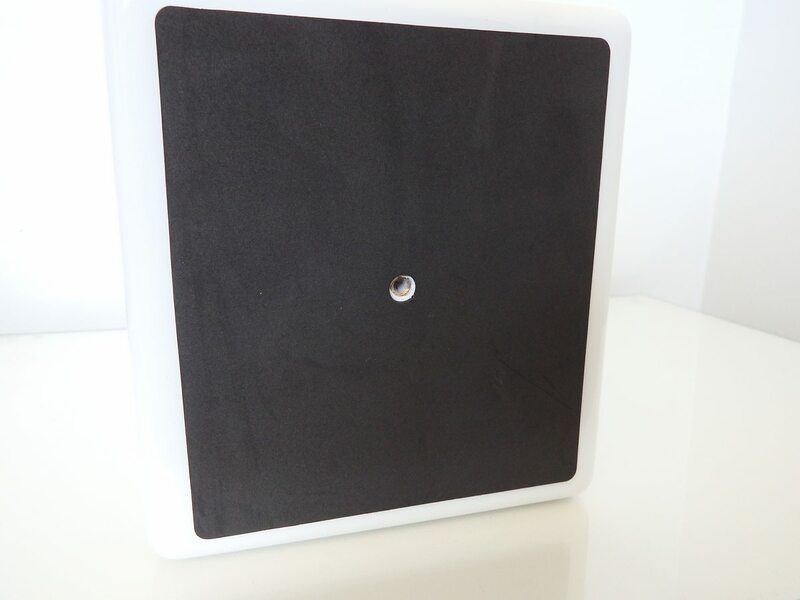 If you spend a lot of time in a single space and enjoy your audio then the Audioengine A5+ wireless speakers could be one of the best additions to your environment. Audio has a profound impact on our state of mind. It can make or break the ambience of a room and it can set the vibe for a gathering. 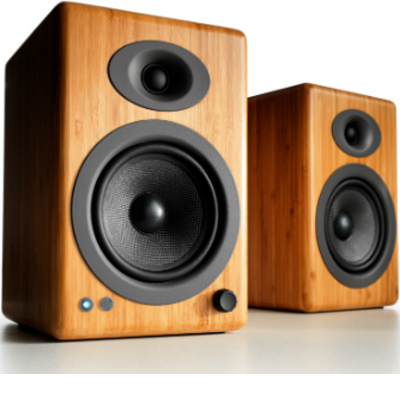 When choosing speakers for your office, studio, living room or family area there are many different products to choose from, ranging from the economical entry level to the audiophile or exotic. The Audioengine A5+ wireless speakers sit somewhere in the middle and bring premium audio to the average (or perhaps slightly above average) consumer at a reasonable price for what you get. 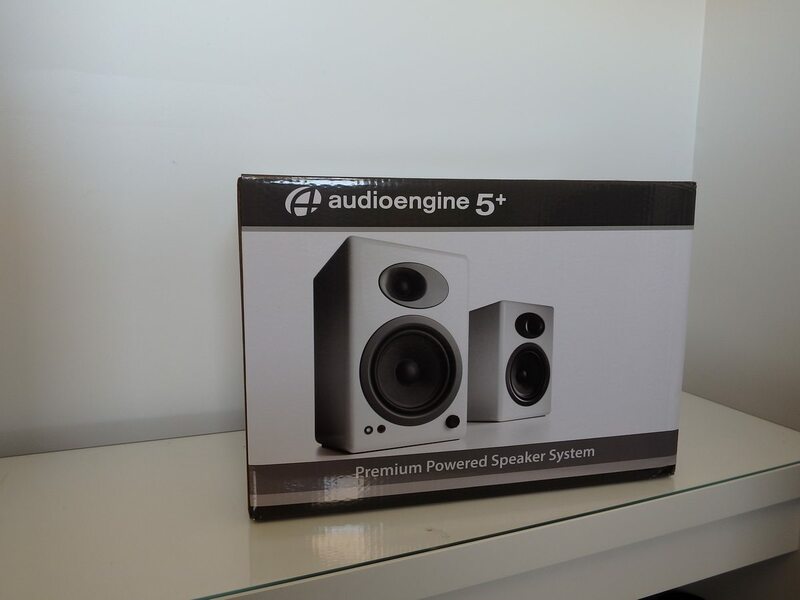 Audioengine’s A5+ wireless speakers are high quality, attractive bookshelf speakers that have dual wired inputs with additional Bluetooth connectivity. 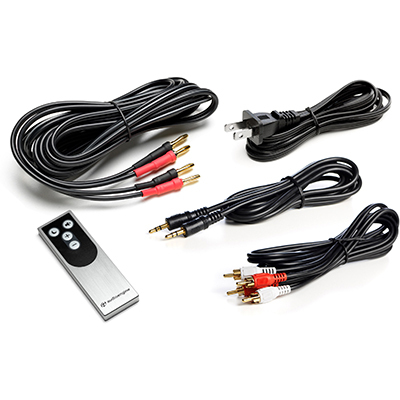 The connectivity options mean that you can connect an audio source such as a CD or record player with RCA connectivity, another device such as an iPod, game console, laptop or PC via the 3.5mm input and still be able to listen to your smartphone or tablet without needing to think about it. The A5+ wireless speakers use a dual Class AB monolithic amplifier – which is common in the consumer space and is selected to basically eliminate crossover distortion. 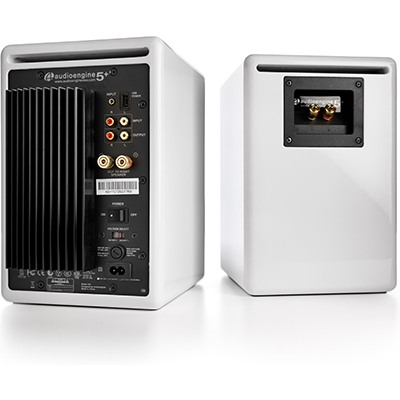 Rated at 150W, the A5+ wireless provide 50W RMS / 75W peak per channel and a Signal-to-Noise Ratio (SNR) of >95dB thanks to a 24-bit DAC that upscales Bluetooth audio. The frequency response is 50Hz-22kHz and the impedance is rated at 10K ohms. 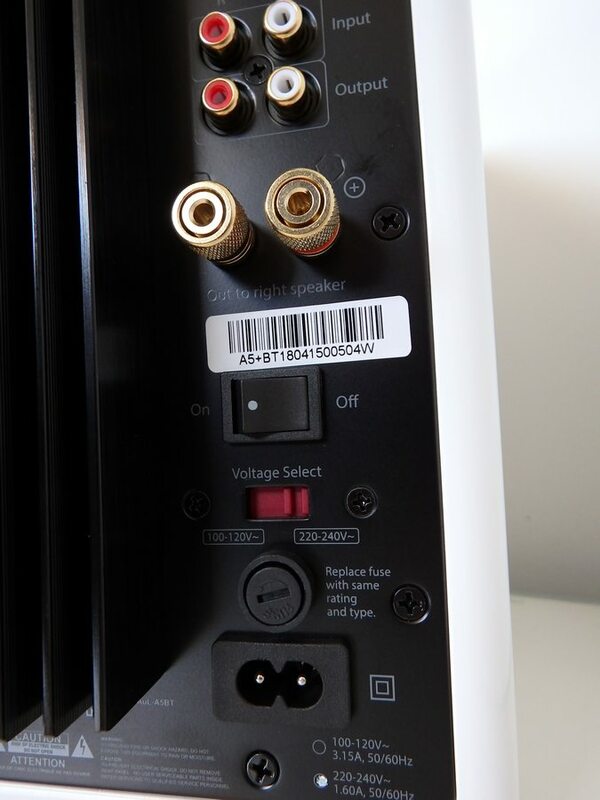 It’s also worth noting that the Bluetooth range is rated at up to 30 metres and there is a dedicated external antenna on the rear of the left speaker. Bluetooth range will vary depending on other factors such as environmental conditions, obstructions and the transmission capability of the source. 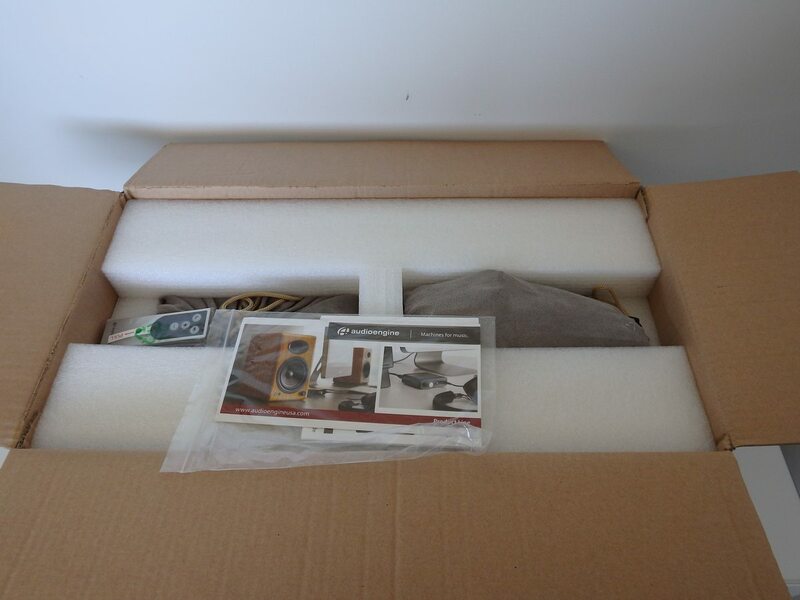 5″ woofers are made from aramid fibre which is known to minimise sound distortion, providing both clear and precise audio as the synthetic material is strong and resistant to both heat and external interference. 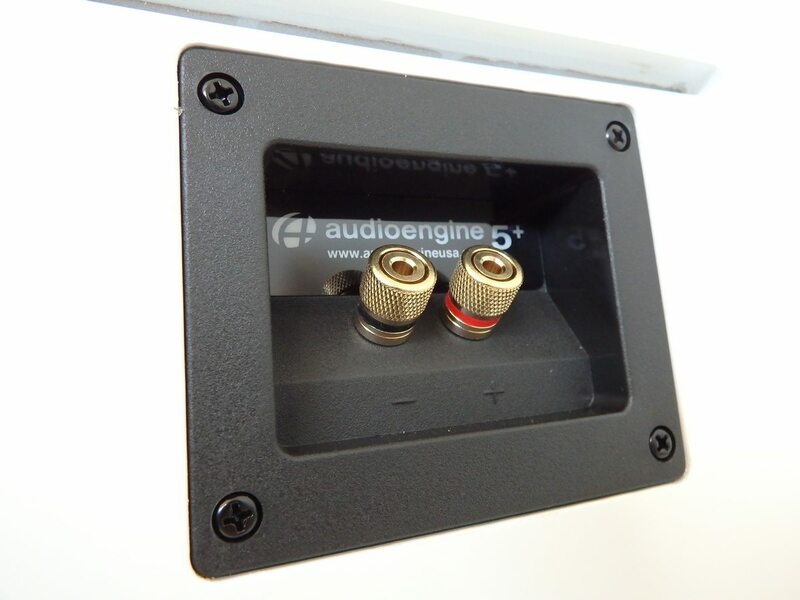 The 3/4″ tweeters are the silk dome type. Solid metal remote that looks built to survive a thermonuclear winter. But the sound … the sound! It simply left me in awe. Let’s go through the specs and build quality first, then I’ll go through how I used the A5+ wireless speakers in day to day use and why I’m so smitten with them. The sound produced by the A5+ wireless is great and I expected these speakers to sound good from the second I opened the box. 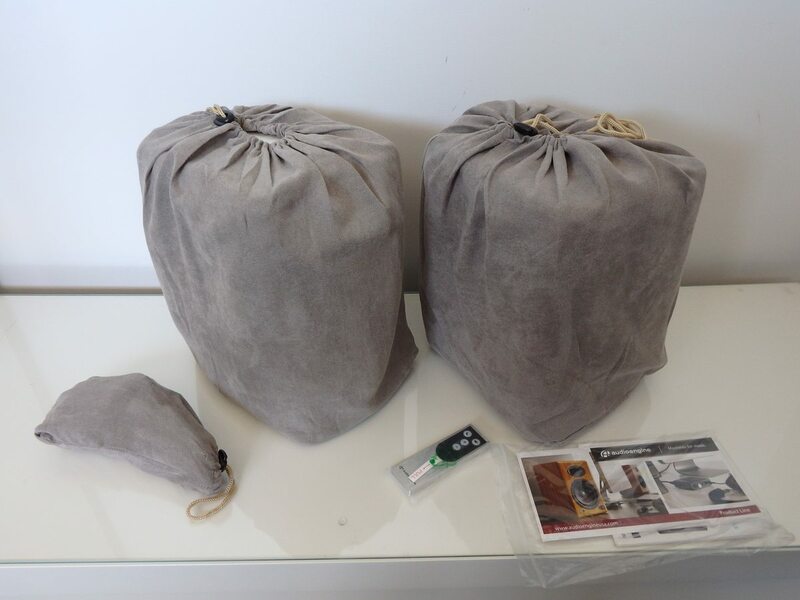 The packaging protection includes cut-out foam inserts, soft cloth bags with draw-strings AND white protective 2mm thick foam bags – that’s 3 levels of protection. Audioengine clearly want to make sure that their products get to the consumer in mint condition, and they sure did. The remote is small but made from heavy aluminium and I can’t see it breaking, no matter how many times it might get dropped, sat on or even stepped on. 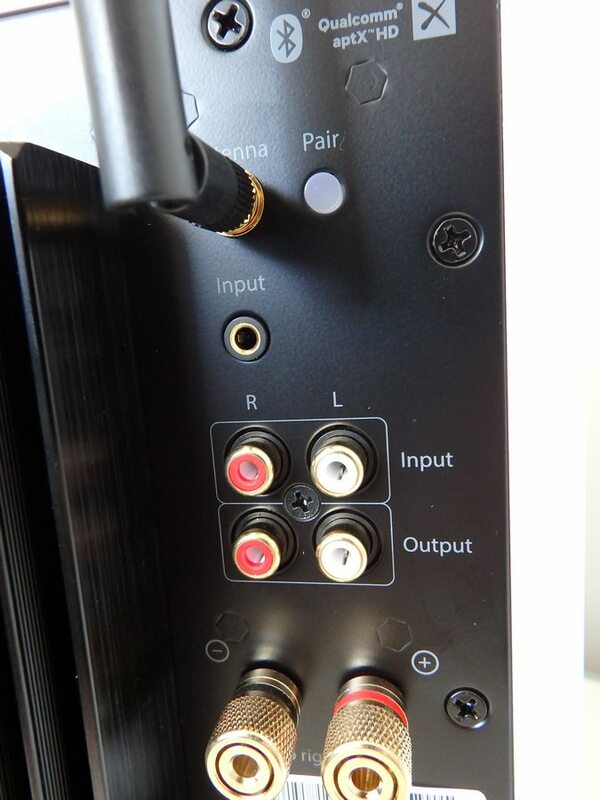 Looking at the connectors on the rear of the speakers, the connections have gold plating and are premium quality, as are the leads. 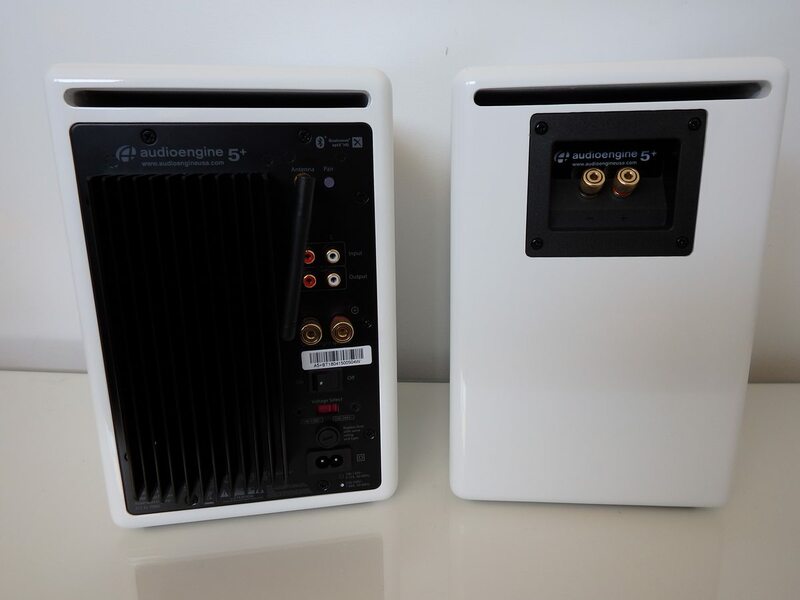 Audioengine specify that the A5+ wireless speakers are shielded to protect against most interference and I didn’t notice any problems from other devices such as 3G and 4G phones, Wi-Fi devices or appliances such as a fridge or microwave oven. 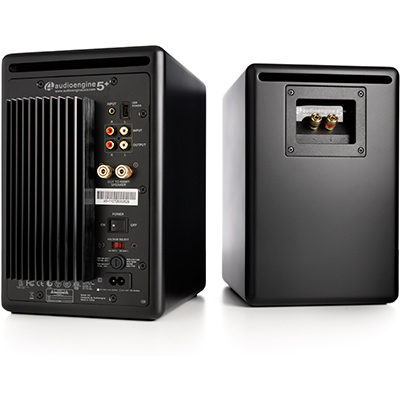 The power switch is heavy duty and the rear of the left speaker is dominated by a set of fins from the heat sink that silently cools the built-in amplifier and Bluetooth receiver. 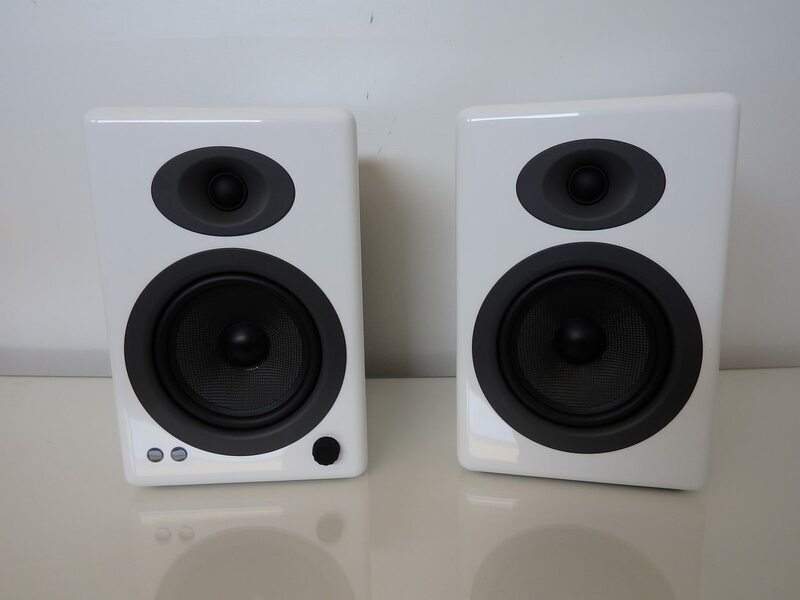 Finally, the finish of the speakers themselves is a glossy white (in our review sample) that remained easy to keep clean, requiring only a microfibre cloth to wipe off dust in a single sweep. There are no cavities on the housing to hold dust or leave marks from where the surface was wiped. During the day I like to listen to music while I work – usually Spotify via either the app on my PC or Bluetooth from my iPhone or iPad. I found that the general clarity of any genre and bass delivered by the Audioengine A5+ wireless was fantastic. Everything sounded good, no matter what type of music it was: jazz, pop, rock, classical, live, acoustic, country (yes, I went there, too), metal – nothing seemed to be lacking and everything sounded clear. Clarity – regardless of the volume – is important, as I listen to some music loud and other music at much not so loud. If I have the volume up, the only distortion I want to hear is what the artist intended in the recording and not the driver buzzing; the Audioengine A5+ wireless gave me this. Acoustic tracks, in particular recordings of live acoustic shows are played a lot in my workspace and the A5+ wireless speakers do these recordings justice. I felt like I could hear everything with Chris Cornell Songbook album, from the background noise of the small audience, to the strings on the guitar and even the odd echo. It was impressive and left me inspired to chase more live acoustic covers of all sorts of music. I expanded my search to lossless FLAC formats and listened to these through the ASUS ALC1220A SupremeFX audio platform on our ASUS ROG STRIX test bench. With a violinist in the family, some classical string music also received airtime on the A5+ wireless speakers with good results, proving that these speakers really are great all-rounders and well suited for a shared space or a space that may serve multiple purposes. Movies and gaming can’t be forgotten either. I used the A5+ wireless speakers with a 35″ 21:9 Benq EX3501R monitor in an office environment and sat just under 2m away to watch Lord of the Rings, Star Wars Episode IV, Gladiator and some TV shows. The musical scores sounded full, the effects were present and free of any distortion while the dialogue remained clear and easy to hear. When there was a lot going on, I could identify it all without the distinct sounds blurring together. First Person Shooter games and RPGs were very immersive on the 35″ ultra-wide screen with the strong audio supporting it, sounding like it was coming straight out of the screen rather than the speakers either side. When playing Rocksmith, the Audioengine A5+ wireless really shone. Ubisoft’s Rocksmith is similar in concept to Guitar Hero but you use a real guitar or bass via a proprietary cable and play along with your favourite songs – or simply learn how to play. The game is all about the music, not graphics or virtual immersion so the quality of your speakers or headphones makes the experience much better. It didn’t seem to matter if I was sitting at the desk with the speakers about 60cm away on either side or sitting 2m away watching a movie or even on the other side of the room, the sound seemed to just fill the space – which is exactly what I want when selecting speakers in a workspace like mine. Overall, the biggest surprise was the bass. It’s better than I’d expected in that it’s deeper and cleaner than I’ve heard on other speakers of similar physical size. The street price ranges from $599 – $699 at the time of writing so hunt around because they are a bargain at $599, if you can score them. 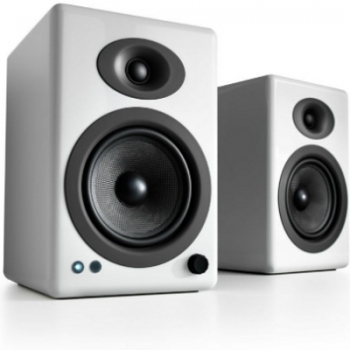 Don’t be put off by the price tag, but rather look at these speakers for what they are – quality bookshelf speakers designed to bring life to a space rather than just a desk. 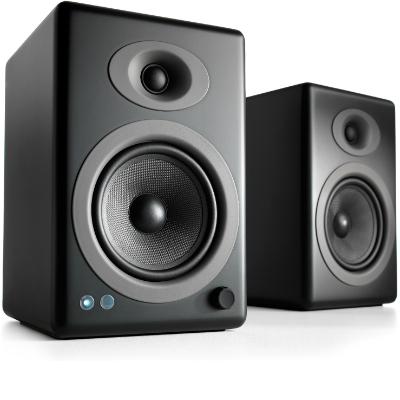 Comparing the Audioengine A5+ wireless to pure desktop study speakers is not a realistic comparison – sure you can use them for this purpose but they are capable of so much more. 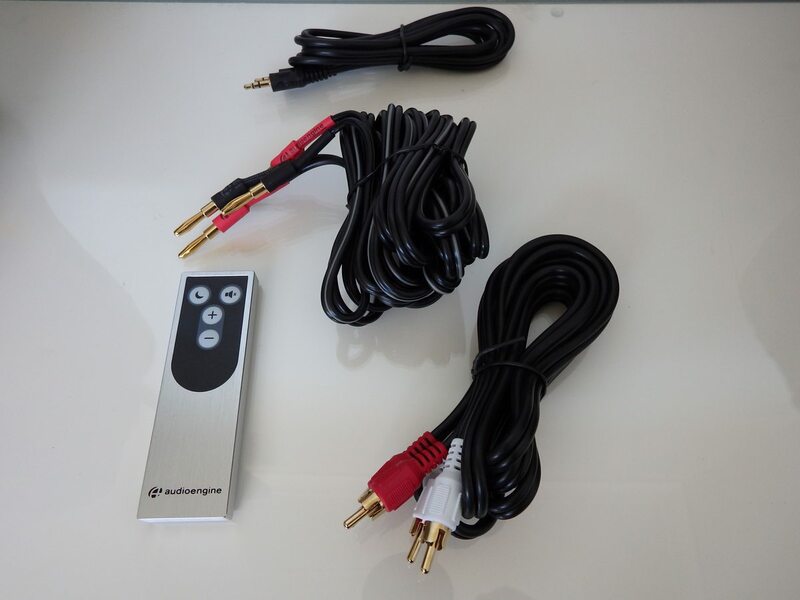 The quality of the A5+ wireless is also worth remembering as is the versatility in that you can have dual wired input sources (3.5mm and RCA connections) plus Bluetooth. There isn’t any real ‘tech’ to get your head around, the speakers pair easily with Bluetooth and the other inputs simply plug in. The volume control also presses for standby mode and the remote has only four buttons to master – all of them intuitive. 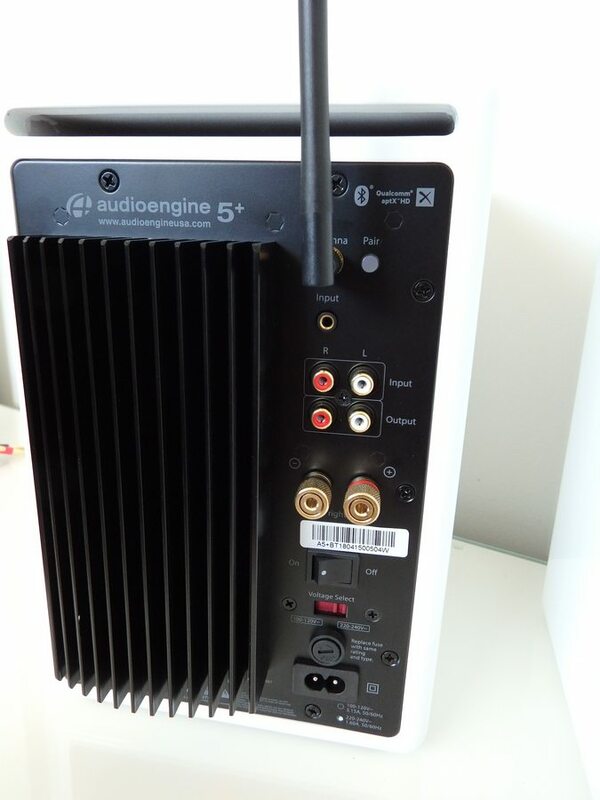 You literally just have to unbox the Audioengine A5+ wireless, connect a couple of cables and you’re away – it doesn’t get much easier than this. The aesthetic is clean, neutral and simple so it doesn’t impose on a space but at the same time, when your attention is drawn to the speakers, they look good. Whilst not small, the footprint seems perhaps smaller in proportion to the sound they deliver. The sound from the A5+ wireless seems well balanced and a good choice for people that need a set of speakers that can perform multiple purposes like movies, different types of music, podcasts or even gaming – be it console or PC. Personally, I’d see these as the perfect companion in a study or studio area where they could control the mood and provide entertainment when required but they would also be just as suitable in a family/living room or rumpus area. 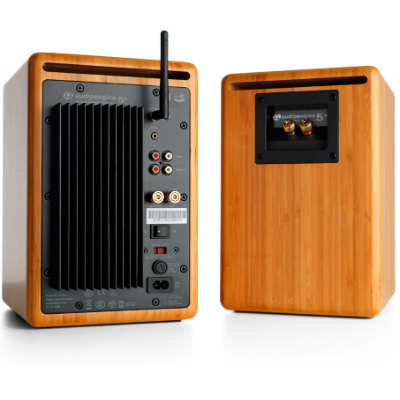 The Audioengine A5+ wireless speakers are an outstanding product that’s so well balanced it could be the star of the show wherever you need decent audio.